Furnace Cleaners in Austin, TX. It is important to have your furnace serviced and cleaned regularly. Servicing and cleaning your furnace regularly will ensure that your furnace will operate efficiently and safely. Most people do not service and clean their furnace regularly. Homeowners generally wait until a problem occurs. That is not the proper way to maintain an efficient and safe furnace. Having your furnace cleaned and serviced regularly will definitely save you money. KEEPING YOUR FURNACE AND FURNACE FILTER CLEAN CAN CUT ENERGY COSTS AND EXTEND THE LIFE OF THE SYSTEM. IT'S ALSO A GOOD IDEA TO HAVE YOUR FURNACE ROUTINELY INSPECTED AND CLEANED BY A FURNACE CLEANING PROFESSIONAL. If small issues are identified and fixed immediately you can avoid having to pay more money due to this small problem becoming a big problem. 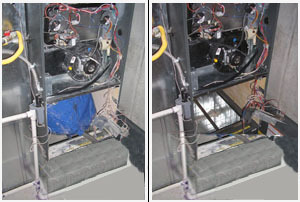 Many small problems can ultimately cause major breakdowns with motors and failing heat exchangers within the furnace. Austin TX Furnace Cleaners is a company that takes pride in their work. Our highly skilled and trained professionals clean the blower, motor, burners and heat exchangers when we service and clean your furnace. In addition, our technicians will check and inspect operating temperatures, belts, pulleys, bearings and ignitors. Many furnace cleaning company technicians are not as thorough when cleaning your furnace. We will make sure the furnace is in top condition when we leave your home or business. As a courtesy to our customers, our technicians will inspect the humidifers, air filters and your air duct system. If there are any problems we will recommend the right solution. Dirt, dust and debris can accumulate in your furnace. These contaminants can waste fuel and ultimately lower your furnaces efficiency. Dirt, dust and debris affect all the components of a furnace and should be cleaned and maintained regularly. The filter system, blower and motor should be maintained on a regular basis. Don't wait until there are major problems. Cleaning regularly can avoid disaster. Just imagine your heating and/or cooling system breaking down during the coldest days of winter or hottest days of summer. Regular inspection, maintenance and cleaning can guarantee that you will never be stuck in this situation. 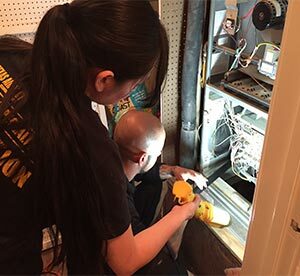 It is extremely important to have a professional inspect, clean and maintain your heating and/or cooling systems regularly.